Centrifuges are utilized in academic, clinical, and research laboratories to separate fluids, gases, or liquids based on the principle of centrifugal force. By spinning at a sufficient speed, a centrifugal force is created on the substances in the centrifuge. The centrifuge operates using the principle where the centrifugal forces cause denser substances to move outward, away from the center. Concurrently, substances that are less dense are displaced and move toward the center. In order for this process to work correctly, the rotational speed of the centrifuge must be within specification. According to the Equipment section of the Food and Drug Administration standards (Code of Federal Regu-lations, title 21, sec. 606.60) centrifuges that are used with testing of blood and blood components must be checked frequently. Refrigerated centrifuges must have the speed and temperature observed on each day of its use and general lab centrifuges must be calibrated by a tachometer every 6 months. 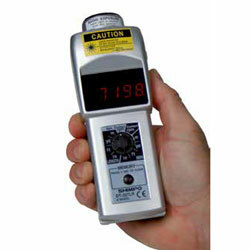 To ensure proper performance for their clients, a prominent clinical laboratory that provides services to their local hospitals and medical centers employs the non-contact, laser sensing feature of the Shimpo DT-207LR Tachometer. The included reflective tape placed on the centrifuge’s rotating part enables the tachometer to detect the centrifuge’s speed quickly and accurately. The laboratory can readily offer this service regardless of customer’s centrifuge due to the wide range of the DT-207LR Tachometer, enabling it to be compatible with low speed, high speed, and ultra-centrifuges (up to 99 x 103RPM). The laboratory’s technicians trusts the Shimpo tachometer for accurate measurements over the many years of usage without issue and will continue to use for years to come as there is nothing simpler or more cost-effec-tive.